Pack your bags if you've been waiting for cheap fares to fly somewhere. Airlines are battling again for your business in a fall airfare war. Dallas-based Southwest Airlines fired the first shot, cutting some fares to just $69 each way to certain cities. 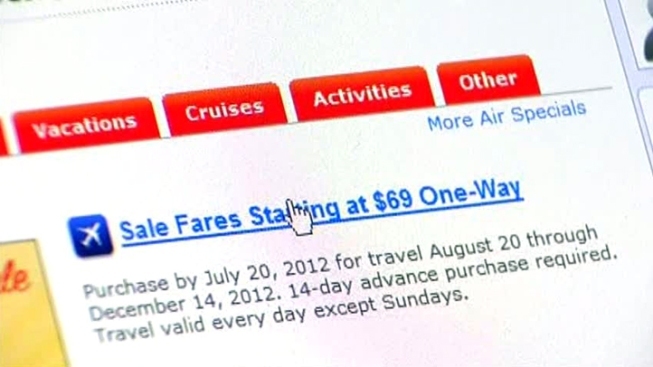 "Right now, we're going into a stretch that's going to be bargain basement -- some airfares that people thought they would never ever see again, and we're going to see good, good deals," said Tom Parsons, of BestFares.com. Fort Worth-based American Airlines and other major carriers quickly entered the fray, matching Southwest on selected routes and putting others on sale. Dallas/Forth Worth International Airport to Fort Lauderdale on American is now just $228 round trip for flights from mid-August to early November. "There's little tricks here," Parsons said. "You need a 14-day advance; I would still say you're going to get your best fares starting around August 21st through October fourth." Southwest is offering some trips for even less than the advertised $69, such as Dallas Love Field to Tulsa, Okla., for just $50. Flying to Europe is also a bargain. "You will find tons of cities going to Europe -- Barcelona, Madrid, to London for less than a $1,000," Parson said. "Many of them are actually going to be in the $900 range." Thank lower fuel prices, with oil trading Tuesday at less than $84 per barrel. If prices hold steady, Parsons predicts even more sales in the months ahead.